Cerebral palsy is the most common movement disorder encountered in pediatric physical therapy practice. Physical Therapy for Children With Cerebral Palsy: An Evidence-Based Approach is a unique, comprehensive reference that focuses on physical therapy management of children with cerebral palsy through the analysis and synthesis of published research, and it offers evidence-based teaching and learning opportunities to a wide reading audience. Inside, Dr. Mary Rahlin examines the current approach to the diagnosis and classification of cerebral palsy and explores the research evidence related to prognosis; medical management; and physical therapy examination, evaluation, and intervention for children with this condition. Physical Therapy for Children With Cerebral Palsy analyzes cerebral palsy as a lifespan condition and utilizes the framework of International Classification of Functioning, Disability and Health (ICF). Sections include: *Typical and atypical development of movement and postural control *Cerebral palsy as a development disorder *Medical management of alterations of body structures and functions by body systems *Physical therapy management, including theoretical foundation, research evidence, and practice *Normal and abnormal gait patterns and current evidence for orthotic management and assistive technology *Transition to adult life Unique topics discussed: *Variability, complexity, and adaptability in motor development *The interdisciplinary team and effective interprofessional collaboration *Assessment and management of therapy-related behavior *Complementary and alternative interventions *Segmental kinematic approach to orthotic management via ankle-foot-orthosis/footwear combination Other unique features include "Questions to Ponder" and "Suggested Questions for Future Research" at the end of each chapter. These are intended to generate healthy professional debate on a variety of topics, both in the classroom and in the clinic, and challenge the readers to plan new studies in search for evidence that will continue moving the pediatric physical therapy practice forward. Also included with Physical Therapy for Children With Cerebral Palsy is online access to video clips that accompany the text and highlight typical and atypical development, use of assistive technology, life span issues, and transition to adulthood. Instructors in educational settings can visit www.efacultylounge.com for additional materials to be used for teaching in the classroom. 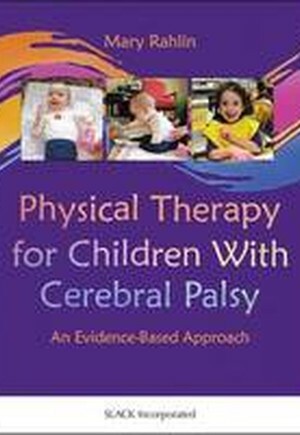 Physical Therapy for Children With Cerebral Palsy: An Evidence-Based Approach is intended for physical therapy students, educators, residents, and experienced clinicians, including physical therapists, other members of the interdisciplinary team, and researchers working with children with cerebral palsy.